Managers who are trying to maintain the glory from their design days even though they’re long behind them need to just stop. Mental abuse, cheap rhetoric and corporate sabotage is a black path. Hire people smarter, faster and better than you and then get out of their way. All of the people on my team are better than me. My designers are more creative and more technically able. My writers are more accomplished, eloquent and far more willing to write circles outside the square box. Even the web developers, project managers and others I have helped interview for other managers could trample my feeble skills with their stampede of awesomeness. One thing that I have slowly discovered over the years: A good creative manager’s job is not to be a good creative that manages, but a good manager who is creative. And as a manager, your Number One Job is to hire people smarter than you and empower them to do their jobs to the absolute threshold of their ability. 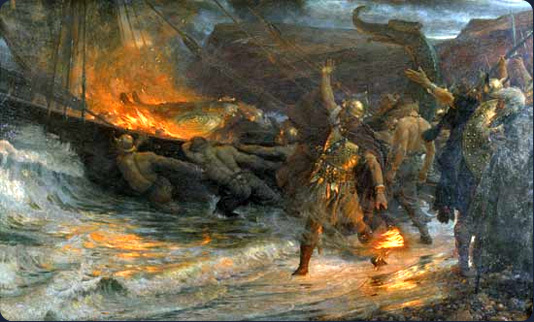 Once you have passed into the golden Valhalla of Middle Management, your role as a day-to-day “designer” should be wrapped in oiled rags, laid on a viking ship in the waning light of dusk, and set ablaze to fade into the opaque mists of Been There Done That. Insecure, thumb-sucking managers might get night terrors over the idea of not being the top creative dog, but chances are they a) should never have been promoted or b) were prematurely promoted or c) should never have been promoted. These are the type of people who are poison to an organization; they hire mediocre talent to beat like dogs, hoard praise like a crack whore, and sabotage all efforts of their pitiable reports to better themselves. We’ve all worked for these devils. We all hated them. And trying to “coach” a manager who cannot stand the idea of not being the center of the universe is like trying to coach a dead cow to lay golden eggs. People who confuse good management with good functional skills have set themselves up for slow, painful failure. There is always someone better than you. Find them. Hire them. Pay them. Lead them. Let them do their jobs. If you’re a manager and not doing these precise things in that exact order, shame on you, relinquish your post immediately, and return the toasted Nordic longship to the rental knowing you’re not going to get your deposit back. The post makes me remember Sally Hogshead’s book, Radical Careering. One of her points that she makes is: Aspire to be the dumbest person in the room. It’s an interesting way of looking at things and I think is along the lines of what you are talking about.